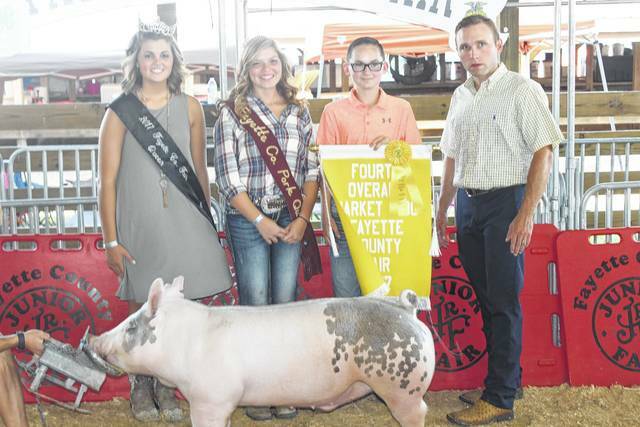 Carley Payton (holding the banner) finished fifth overall at Wednesday’s Fayette County Junior Fair Swine Show. She is pictured with family and fair royalty. Zander Ivey (second from right) finished fourth overall at Wednesday’s Fayette County Junior Fair Swine Show. He is pictured with Fair Queen Marissa Sheets, Pork Queen Kendal May, and judge of the hog show, Nathan Day. 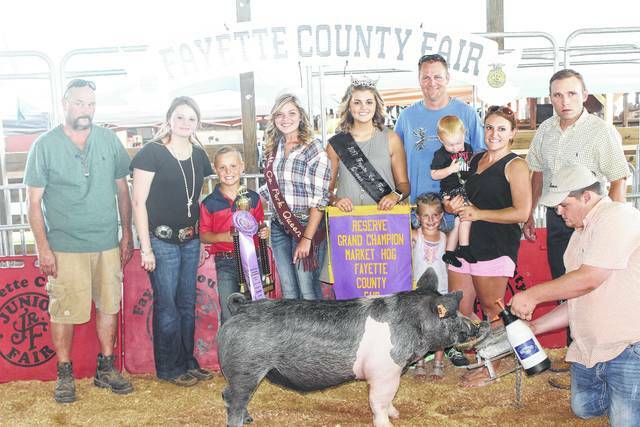 Meri Grace Carson (holding the banner) finished third overall at Wednesday’s Fayette County Junior Fair Swine Show. She’s pictured with family and fair royalty. Kaden Bryant (third from left) won reserve champion market hog at Wednesday’s Fayette County Junior Fair Swine Show. He’s pictured with family and fair royalty. Graham Carson (second from right) won grand champion market hog at Wednesday’s Fayette County Junior Fair Swine Show. He is pictured with Fair Queen Marissa Sheets, Pork Queen Kendal May, and the judge of the hog show, Nathan Day. Fourteen-year-old Graham Carson won grand champion market hog for the second time in his young fair career on Wednesday at the Fayette County Junior Fair Market Swine Show. From the age of 2, Graham took an interest in showing and raising hogs. This devotion has been fruitful for Graham, who first won the grand champion trophy in 2014. Wednesday’s hog show at the hog pavilion was a big day for the Carson family, as Meri Grace Carson – Graham’s sister – also did exceedingly well by finishing third place overall with her hog. Meri Grace raised the hogs with some help from her brother. The reserve champion winner also turned out to be a remarkable, feel-good story: 9-year-old Kaden Bryant won the prize in his very first year showing hogs. Kaden said he wasn’t sure yet how to feel about his incredible accomplishment, and added that he worked hard to get to this point. Rounding out the top five for overall swine were fourth place, Zander Ivey, who also finished in the top five in swine showmanship Tuesday; and Carley Payton finished fifth. The judge at the show, Nathan Day, said the quality of hogs at the Fayette County Junior Fair is top-notch. Light Cross Gilts: Grand champion Konner May and Reserve champion Drake Sharp. The class winners were: Weston Pettit, Tannon Huff, Hannah Cummings, Emily Reeves, Ella McCarty, Kaden Bryant, Konner May, Adam McCoy, Carley Payton, Kylan Knapp, Tori Evans, Alexis Hagler, Tanner Eggleton, Sidney Payton, Hillary McCoy, Zander Ivey, Kaden Bryant, Heath Cockerill, Kaelin Pfeifer, Hanna Reisinger, Kasi Payton, Lindsey Worley, Cole Karnes, Cameron Casto, Graham Carson, Drake Sharp, Konner May and Heath Cockerill. 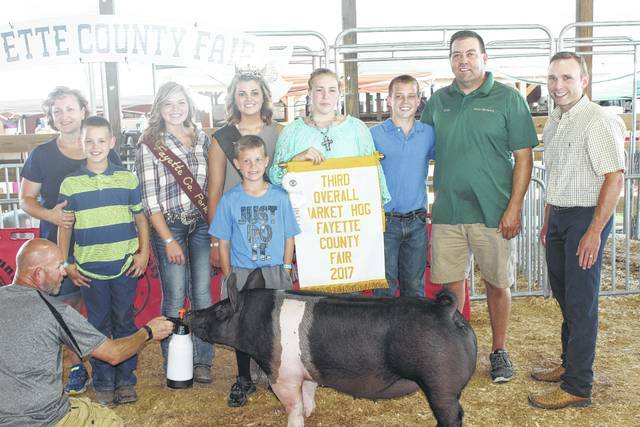 https://www.recordherald.com/wp-content/uploads/sites/27/2017/07/web1_IMG_9377.jpgCarley Payton (holding the banner) finished fifth overall at Wednesday’s Fayette County Junior Fair Swine Show. She is pictured with family and fair royalty. https://www.recordherald.com/wp-content/uploads/sites/27/2017/07/web1_IMG_9370.jpgZander Ivey (second from right) finished fourth overall at Wednesday’s Fayette County Junior Fair Swine Show. He is pictured with Fair Queen Marissa Sheets, Pork Queen Kendal May, and judge of the hog show, Nathan Day. 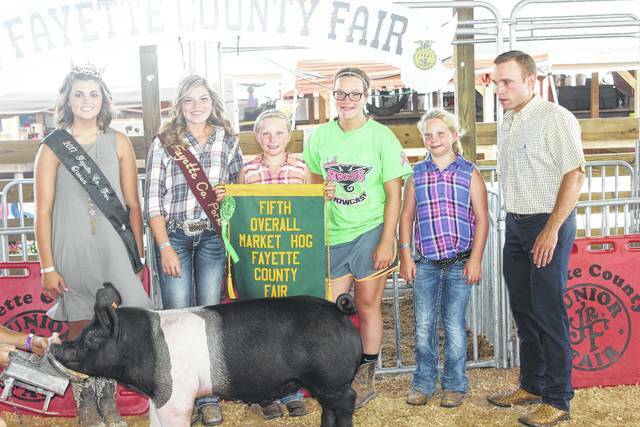 https://www.recordherald.com/wp-content/uploads/sites/27/2017/07/web1_IMG_9363.jpgMeri Grace Carson (holding the banner) finished third overall at Wednesday’s Fayette County Junior Fair Swine Show. She’s pictured with family and fair royalty. https://www.recordherald.com/wp-content/uploads/sites/27/2017/07/web1_IMG_9356.jpgKaden Bryant (third from left) won reserve champion market hog at Wednesday’s Fayette County Junior Fair Swine Show. He’s pictured with family and fair royalty. 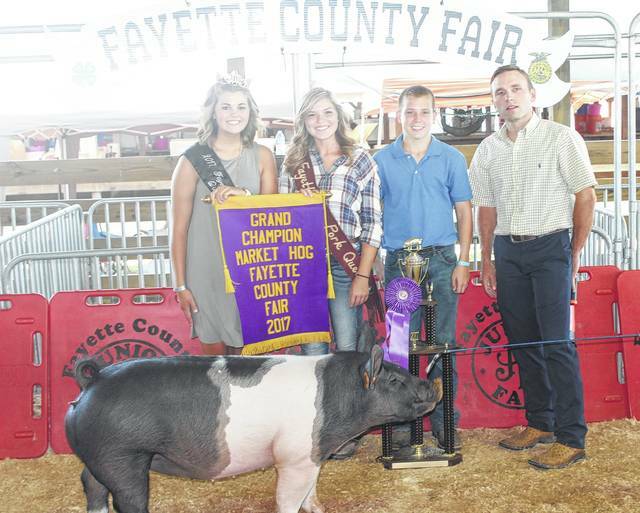 https://www.recordherald.com/wp-content/uploads/sites/27/2017/07/web1_IMG_9340.jpgGraham Carson (second from right) won grand champion market hog at Wednesday’s Fayette County Junior Fair Swine Show. He is pictured with Fair Queen Marissa Sheets, Pork Queen Kendal May, and the judge of the hog show, Nathan Day.